In this insightful book, a broad group of social work managers discusses what makes an effective social work administrator. The contributing authors describe their work and work environment, detailing what qualities and traits are needed--within themselves, their co-workers, and their organizations--to be effective and successful now and in the future. 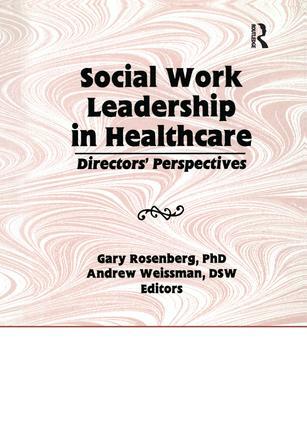 Social Work Leadership in Healthcare provides models readers can follow to help improve the social services functions in their own healthcare organizations. The contributing authors discuss issues applicable to the numerous and evolving healthcare issues in urban, center-city, suburban, and rural communities. They provide a stimulating and exciting group of ideas useful to social workers struggling with the same issues in their day-to-day practice. The book acts as a challenge for future social work administrators in healthcare organizations to carry on in the bold, innovative, and compassionate tradition they represent. Today, social work services are faced with a transformation of the healthcare milieu. In the move toward managed and capitated care, social work and other departments are being decentralized, and social work directors are assuming programmatic operational positions in the healthcare arena. Social Work Leadership in Healthcare helps current and future social work leaders in healthcare maintain and expand traditional values and practice commitments in this changing world.